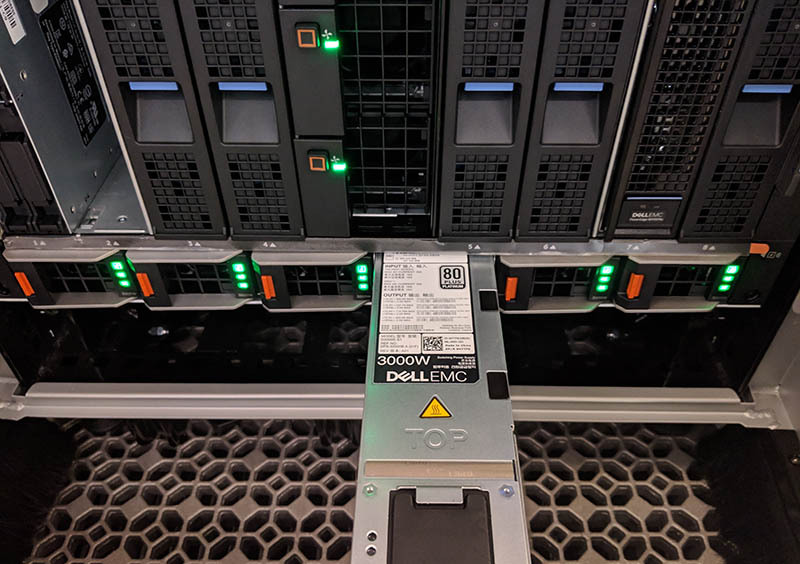 The base of the entire system is the Dell EMC PowerEdge MX7000 chassis. This is a 7U chassis which is smaller than some other units on the market. That 7U chassis weighs around 105lbs empty and can almost quadruple that filled with gear. We first wanted to show the front and rear of the chassis to give some sense of what our readers are looking at. After working with these systems for a few minutes, the major functions become obvious, but if you are new to the PowerEdge MX, you may not immediately recognize the components. You can see a layout with up to eight single-width or four dual-width blades running vertically. There are four fans running through the middle vertically which help cool the rear I/O. The six hot-swap power supplies sit at the bottom of the chassis. 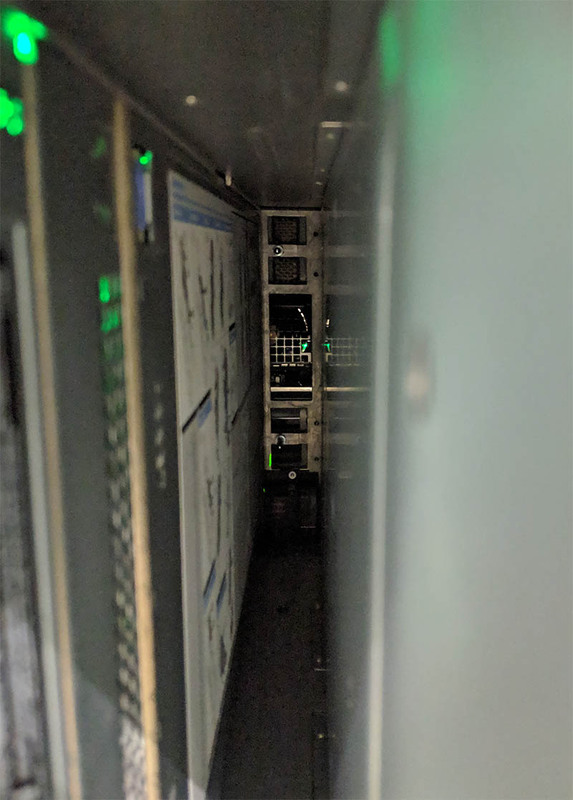 Here is the rear of a PowerEdge MX out of a rack. For some basic overview, the top two horizontal rows are networking and interconnect fabric as is the row below the fans. This horizontal fan row is the row that cools the blades while they are in operation. The next two slots are for storage fabric. Finally, the bottom row has the power connectors on the outside with up to two chassis management modules. 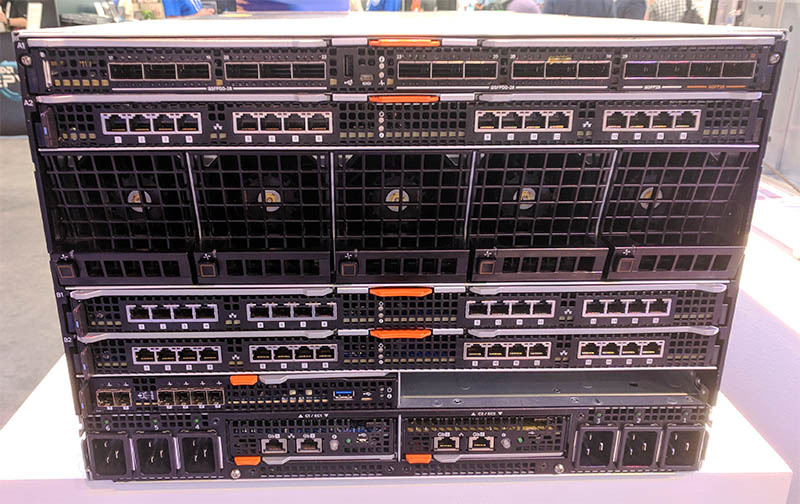 Perhaps the most touted feature of the PowerEdge MX is the lack of midplane. Midplanes in blade servers are features that when they work, nobody thinks about them. When a midplane fails, it usually takes down your entire blade chassis, or a good portion thereof. Midplanes are made of PCB and have some signaling constraints based on how they are designed which means that over generations, you may need to replace a midplane just to use faster networking or storage. 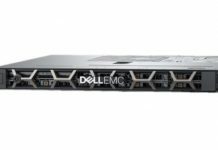 With the PowerEdge MX, Dell EMC did away with the midplane in an extraordinarily forward-looking design direction. As it turns out, a midplane that sits in the middle of a large chassis is very difficult to photograph. We are going to show some of the connections to the midplane in later sections, but we wanted to give some visual representation of this. 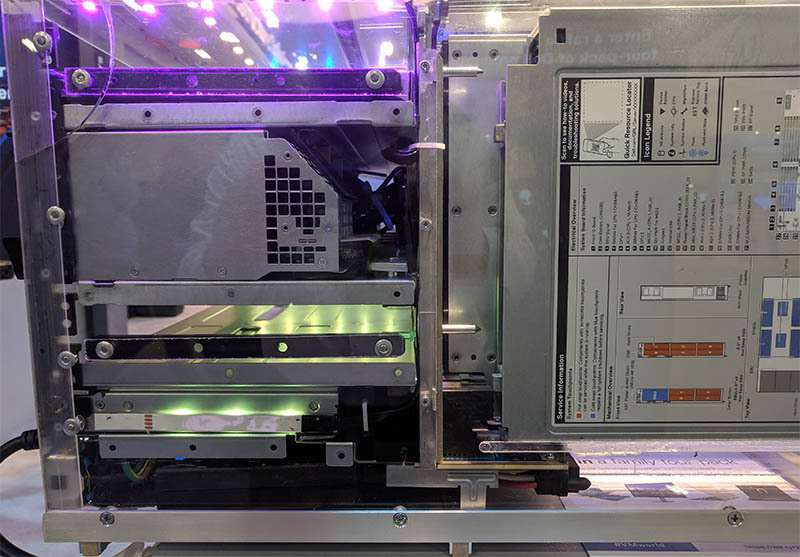 These first two photos are of an acrylic, running, PowerEdge MX model that Dell EMC displays at shows like VMWorld. The benefit of using this depiction is that it is much easier to see than in the middle of a chassis in a dimly lit cold aisle. As you can see, there are guide pins and grooves for components to align, but the components do not plug into a big green PCB midplane. Instead, they have direct connections. For example, blades directly connect to fabric. Here is a shot looking down a blade slot. At the rear, you can see the two connectors near the top which directly attach to the switch fabric modules at the rear of the chassis. There is no PCB midplane here. One can then see the fan spinning. This followed by additional connector spaces for additional fabric modules and storage at the bottom. 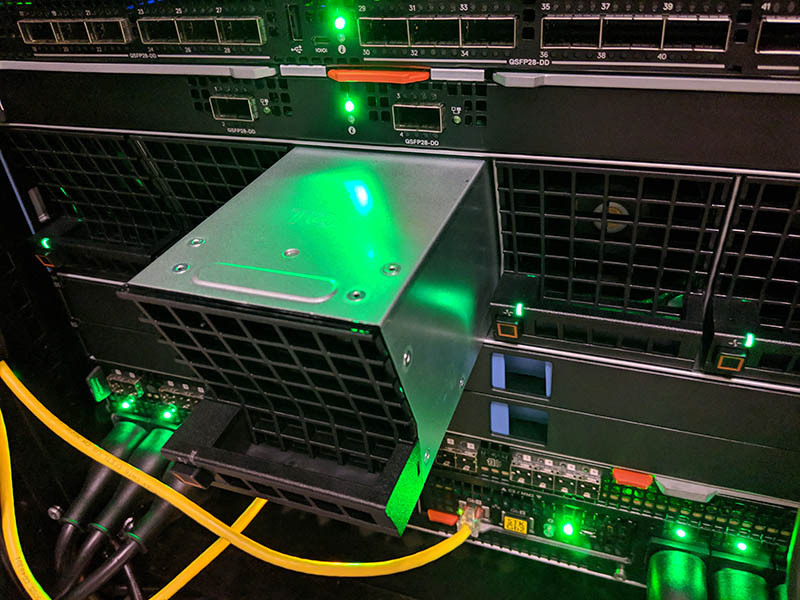 In a traditional blade server, instead of just seeing connectors that are parts of fabric modules, you would instead see a shared PCB at the rear. We are going to talk more about why this is important later in our review. The short answer is that there are two main benefits. First, it isolates potential failures, increasing the reliability of the system. Second, it allows storage and networking fabric to be upgraded without taking the chassis down for midplane replacement. Dell EMC plans to leverage both of these features. 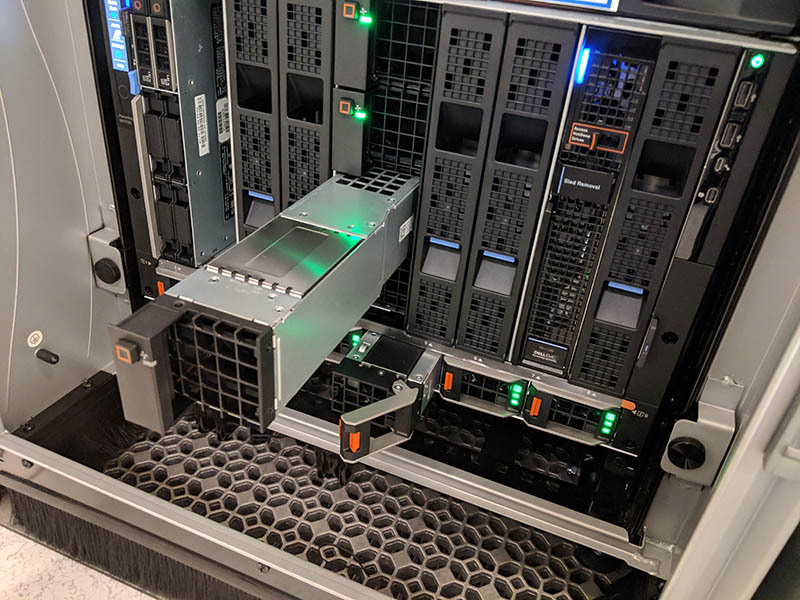 If you are looking at starting a green IT initiative, chassis servers like the Dell EMC PowerEdge MX make a lot of sense. While the compute options are likely to change on a quarterly basis, storage will change perhaps less fast, and networking will continue a march toward faster Ethernet, InfiniBand and next-gen interconnects like Gen-Z, there are some items that will not change. Rack rails, sheet metal, fans, and power supplies all change at a much slower pace. During our time with the Dell EMC PowerEdge MX7000 chassis, we indeed pulled power supplies and fans to validate it all worked as expected. The six power supplies are 80Plus Platinum rated 3kW units which means that the chassis has 18kW worth of high-efficiency power supplies in its current form. The eight units mean that the chassis can survive an A or B side power failure and maintain operation. We took our pulling of random components to a new level, removing front fans and power supplies simultaneously. 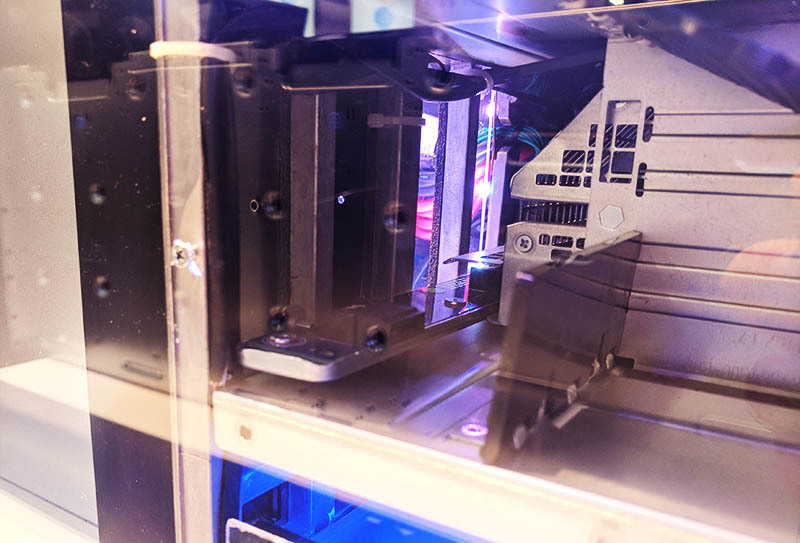 The fans may have a small front profile, but after the simple press of a button and a gentle pull, they can be removed from the chassis following a long pull. We even removed the rear fan as well just to see what would happen. As one would expect, the Dell EMC PowerEdge MX handled this without a hiccup. Fan speeds raised. You certainly want to wear ear protection working in racks of these swapping components even for short periods of time. 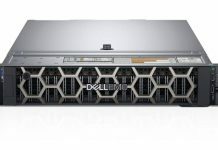 Dell EMC tells us they overdesigned the PowerEdge MX power and cooling systems to be able to handle the foreseeable future of server architecture. For a green IT initiative, the ability to only cycle the bare necessities with each generation means that less waste will be created. We like this direction. 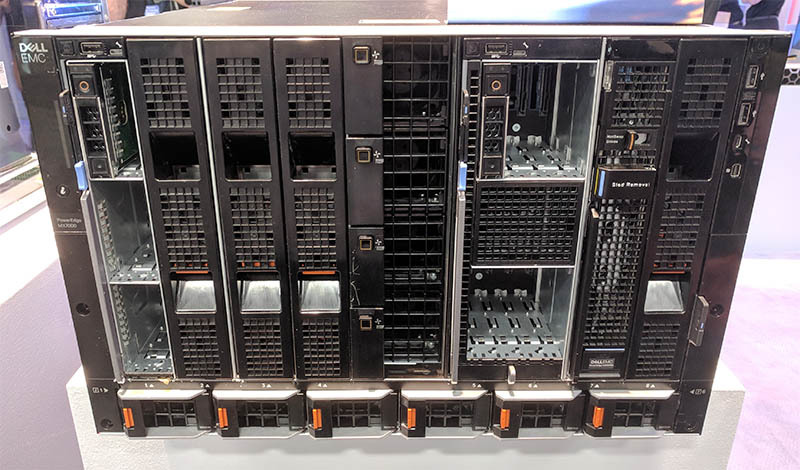 The Dell EMC PowerEdge MX7000 is still a thoroughly modern PowerEdge chassis. The PowerEdge MX7000 gets a LCD touch screen that has a few major hands-on management functions like alerts and information. 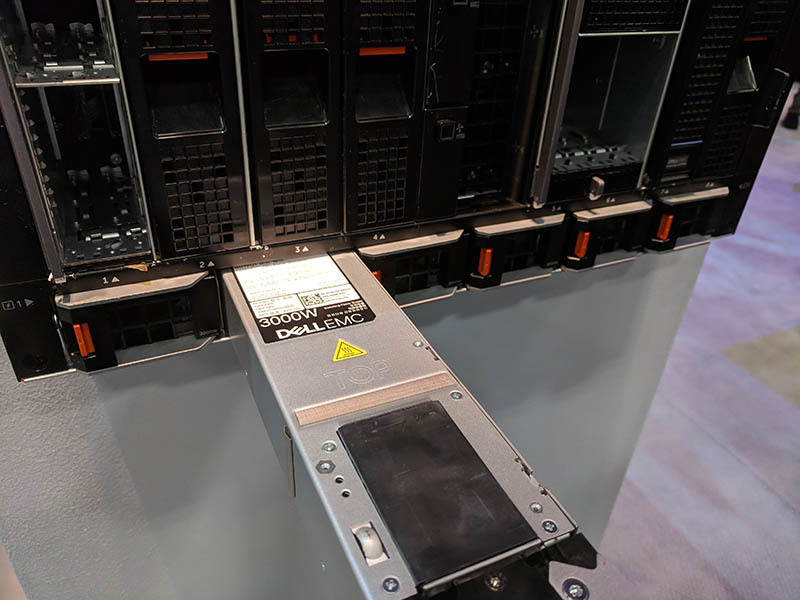 If you are using a server like the Dell EMC PowerEdge R640 or PowerEdge R740xd you may have used Dell EMC’s Quick Sync 2 module which allows pairing a chassis to a mobile device directly. 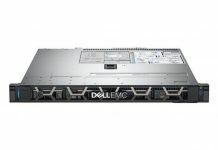 On the PowerEdge MX7000, the feature works just like it does on a standard PowerEdge rack server. This is an optional feature, but it is one that some data centers will adopt. 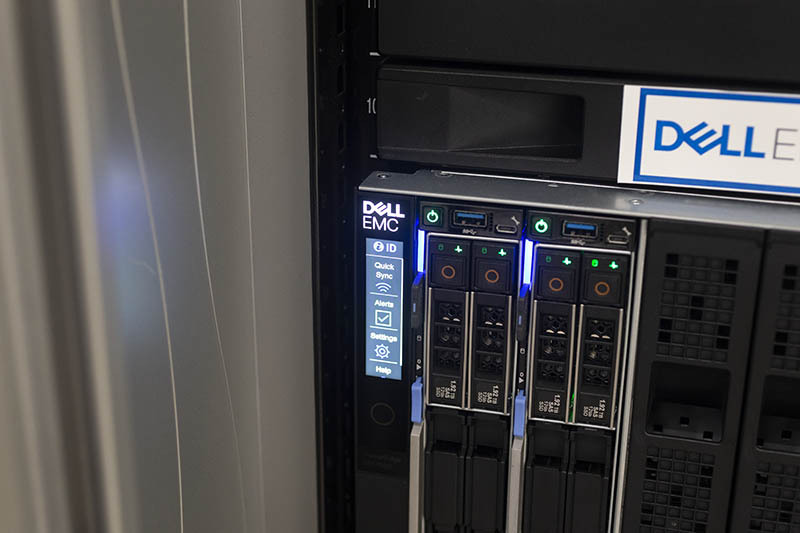 As we are going to see in the management section, Dell EMC has gone through great lengths to ensure that the PowerEdge MX management and features will be familiar to existing users.